The sun shone and the team beamed with appreciation at the magical views all round the Snowdonia National Park and out to the coast. 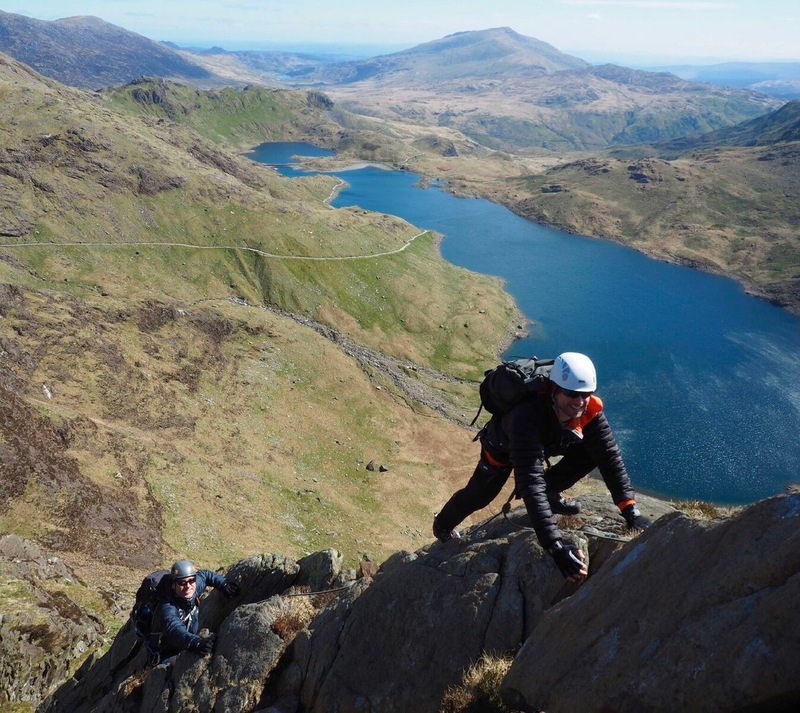 A great setting for this spring Mont Blanc training weekend with a sociable base camp in Llanberis providing good conditions on the accommodation / cafe / pub / curry house front also! Despite some cool & wet West Coast weather, Micheal & Andy enjoyed an action packed weekend of alpine training which was quite challenging from both a physical & cerebral point of view! To quote Andy, the weather was "invigorating!" A couple of classic spring days in the Scottish Highlands gave Marc & John some superb alpine training high on the North Face of Ben Nevis. They even got a bit of 'alpine hut training', staying in one of the UK's few equivalents - the famous C.I.C. Hut, although, as there were no other teams in the hut there was no training in the essenital alpine skill of ifnoring other teams snoring, shuffling, wandering about and general bag rustling! We discuss many mountaineering projects with guests wanting to climb in the Alps in summer and who can see the massive benefits of pre-alpine training courses in winter & spring in the Scottish Highlands. The conditions here often create a tough and exacting environment even for climbing some of the simple 'Munto' summits. Add some quality relevant mountaineering training and a progression of tackling slightly more technical routes and the benefits are obvious & huge. 17/2/2015 - Superb Winter Climbing Conditions Continue on Ben Nevis! The Scottish Highlands and in particular, the West Highlands are currently experiencing the winter climbers holy grail of sustained cold temperatures with stable weather following a period of melt freeze following a period of high snowfall. Lots of ice and lots of stable snow with blud skies above. Perfick! Read more about 17/2/2015 - Superb Winter Climbing Conditions Continue on Ben Nevis! The heavy snowfalls and wild weather conditions across the Highlands over the last few weeks have truly reaped dividends for the winter mountaineer & even ski touring enthusiasts. Many quality ice lines have been climbed on 'The Ben' in the last few days including some highly prized and rarely climbed lines like Shield Direct & Gemini. Point Five and Hadrians Wall have been in good condition also along with many of the other classic ice & buttress routes.